Charter Manager Rebecca Cutter at bluewater sends news of two recently signed motor yacht central agencies for charter in the Mediterranean this summer, the 35m Koi and 24 m Lady Sofia. The explorer yacht Koi (ex-Surprise) was originally built in 2001 by McMullen and Wing and has since been totally refitted in 2009 & 2011, with a completely new interior. She offers luxurious accommodation for up to 8 guests in four lavish suites, including a full-beam owner’s suite on the main deck, two further double staterooms and a twin cabin with Pullman berth for a ninth guest if required. Koi boasts capacious deck space with fully cushioned lounging areas, a sun bathing area forward and 3 sun beds aft (all furniture in varnished teak) in addition to dining for 10 on the sundeck with wet bar and optional roll out sun awning,. Down to the gym deck, again you will find fully cushioned seating and sunbathing areas plus a large drop down TV which makes this an ideal outdoor movie area. The aft deck offers another additional dining area under cover. With an array of water toys and equipment that is second to none, a flexible owner and open calendar Koi has a competitive weekly charter rate of €72,500. Lady Sofia is a prime example of the Ferretti 80 motor yacht series that combines speed and agility in a surprisingly spacious yacht. Constantly updated and upgraded she is in great condition with a pro-charter owner and captain eager to promote her for a successful summer season. Her large deck spaces offer a perfect combination of sunshine and shade with ample sun pads for lounging and an al fresco dining area that can seat up to 15 guests (in port). Her interior shows off all the fine skills of Ferretti’s craftsmanship finished with cream soft furnishing and beautiful cherry wood, and includes an open plan saloon with separate dining area for her eight guests. Two double and two twin cabins below deck, all en-suite, offer a peaceful and lavish haven to escape at the end of a fun filled day. 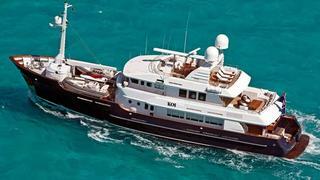 Lady Sofia has accommodation for eight guests and a weekly charter rate of €27,000.